Thank you for being a part of the St. Thomas Aquinas parish family. 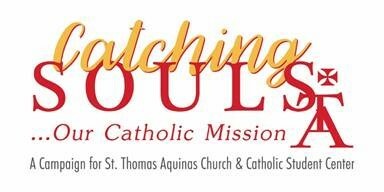 For 70 years we’ve been the home to Catholic Students at Iowa State University, and this fall we are publicly launching a new campaign, “Catching Souls, Our Catholic Mission,” to help realize the vision of Fr. James Supple, our founding pastor. This summer a new Campaign Cabinet began reaching out to alumni and friends, and to date some $3M has been pledged to help support our goal. We know that many of you at STA are here because of a connection with ISU, and we invite you to learn more and participate. Only 30 percent of Americans who were raised Catholic are still practicing. Nearly 80 percent of those who left Catholicism did so by age 23. With more than 8,000 Catholic students at ISU, STA is ground zero for renewing the church. What happens here impacts the larger church. Our students are constantly invited away from their Catholic faith, by the secular culture on campus and by aggressive evangelical Protestant churches. One such church at ISU has 15 full-time campus missionaries that often reach our students before we do. After years of feeling like we are playing defense, I think it is time to go on the offensive in a bold way. We want to build on the success and momentum of our alliance with The Evangelical Catholic. In the past five years, we have gone from four small groups to 43. Our student leadership team has also grown from ten to 72. What we are doing today works. We send out amazing graduates. In fact, this past fall we had 17 ISU graduates in seminary for various dioceses and religious orders. Iowa State has grown 44 percent the past 10 years, but our campus ministry staff has not. We need to be able to recruit and retain our best staff possible. This year we were unable to fill one campus ministry position due to inadequate compensation. Without more support, we will have to settle for hiring entry-level campus ministers who often move on after a few years. Other Catholic student centers have found great support for their missions recently. North Dakota State (Fargo) has raised more than $10 million toward a goal of $24 million. The University of Wisconsin (Madison) has raised almost $27 million toward a goal of $29 million. The University of Nebraska (Lincoln) has raised $25 million toward a new goal of $40 million. The Msgr. Supple Endowment presently supports about 20 percent of the actual cost of Catholic campus ministry at ISU. Fr. Supple’s dream was that one day our alumni would fully support campus ministry. This is our chance to help make that dream a reality by growing the Supple Endowment to better support campus ministry in perpetuity. It will allow us to grow our campus ministry to keep pace with ISU’s record enrollment, and help us create partnerships with groups like FOCUS. Established in 1998, FOCUS (Fellowship of Catholic University Students, www.focus.org) now has over 600 Catholic campus missionaries on 130 campuses. They are excited about being here at Iowa State. Endowing our missionary program is important and will impact the future of our church. An investment in this campaign will allow for more of our resident parishioner resources to support other important parish priorities. With an expanded endowment, a significant part of the funding needed for campus ministry will be removed from our annual parish budget. This budgetary relief will allow the pastoral council to concentrate on the needs of our facility and ministries, discerning operational and capital needs. Possible operational needs include: expanded outreach and RCIA support, additional community services and support for various ministries’ activities (retreats, trainings, etc.). Capital needs may include: upgraded internet and electrical systems, a new HVAC system, replacement of the original upper church windows, energy efficiency initiatives, new student lounge carpeting and furnishings, and a new roof. I am beginning my 17th year at STA, so as we say at Iowa State, I am “all in.” To support this campaign I am giving one year’s salary. It is not a lot of money! But it does indicate how important I believe this is for STA and the larger church. I need you. We need you. Let’s do something together that will impact many generations of Cyclone Catholics. My goal is not only to succeed, but to have fun doing it. Again, I am very grateful for anything you can do to take our Catholic mission at ISU to the next level and make STA @ ISU one of the best Catholic student centers in the country. Thank you for being here. Thank you for your prayers and support. To learn more, read our campaign Case Statement or watch our campaign Video.